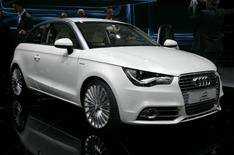 Audi A1 e-tron | What Car? Meet the next member of Audi's e-tron family, the A1 e-tron. We've already seen the sport e-tron coupe at the Detroit motor show and the Frankfurt motor show** but the A1 e-tron takes the e-tron philosophy in a slightly different direction. The Frankfurt car was a high-performance sports vehicle, with electic motors on all four wheels. The Detroit car was a lightweight, compact two seater with two electric motors on the rear axle. The A1 e-tron is a classy three-door four-seater powered by lithium-ion batteries and a small combustion engine. It can go for 31 miles on electric power alone, and that is extended by a further 124 miles with the aid of the petrol engine. The car always drives on electric power - the engine recharges the battery and doesn't drive the wheels. This means the car is capable of an incredible 148.7mpg and emits 44g/km of carbon dioxide. The 100bhp A1 e-tron has a top speed in excess of 80mph and can go from 0-62mpg in just over 10 seconds. A fully depleted battery can be recharged in approximately three hours from the 380 volt grid. A display immediately adjacent to the plug-in connection shows the current charge status and the charging time remaining.